I am currently on a vacation leave until the new year! Yipeee! Unfortunately, since my sister don't have any leave credits yet and Paul is as busy as ever, I have to make the most of my leaves alone and in town. Well, one thing is for sure. I am making the most of these three precious days before I finally drag myself back to work by January 2. Weeks ago, I've decided that this will be my "pamper-me" leave where I'll spend most of my time relaxing and rejuvenating for the new year. 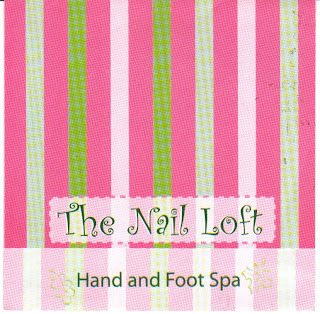 Today was Day 1 and first stop was The Nail Loft. This small neighborhood-type spa is slowly getting the attention of girls who frequent the San Juan area. I've heard a lot of raves from my friends and obviously I know i just have to try it out myself. Aside from their long list of services, they have 8 packages available and I find the rates to be very reasonable. Reasonable because they use big name brands like Essie, Orly, L'oreal and Sally Hansen which tells me that they really know what girls want! I chose Package 4 that includes: GM (Glamorize Me) Mani/ GM Pedi / Foot Spa. All these for only P550. not bad right?! I was led to my little corner a.k.a. a couch with drapes beside it for a more private effect and my attendant Mimi offered me a cooling cucumber eye mask. WOW! She gently placed it on my eyes and I immediately dozed off for a short nap. It was a good start for my pamper-me leave, for only P550 I now have spunking polished nails and soft hands and feet as well!